Raided the recently mentioned Asian grocery store again, and came home with five different kinds of noodles, frozen okra, some instant dashi granules and ssamjang. Since noodles obviously are one of my favorite kinds of food I thought I’d make some. 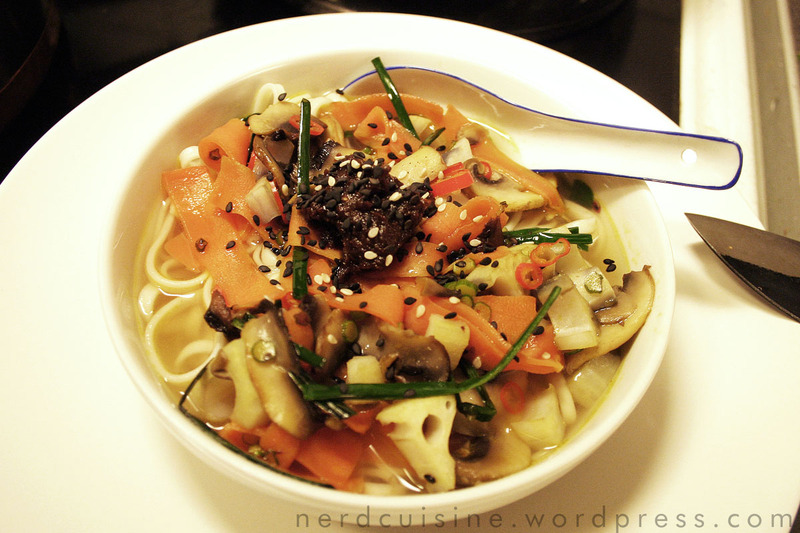 Leek, dashi, mushrooms, red chili pepper, carrot, garlic sprouts, ssamjang, udon noodles and lotus roots. Since udon noodles are commonly served in soup that’s what I’m going to do. Ingredient-wise this dish has roots in Japan, Korea and probably China too, so I’m ending up with a general Asian concoction again. This doesn’t really bother me, since the main objective is to simply make tasty food. 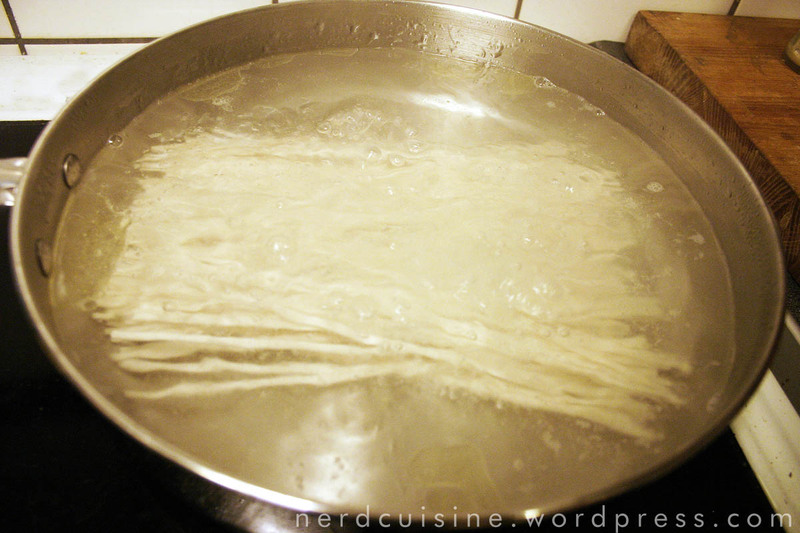 Noodles boiling away. I put them in a sauté pan only in order to be able to put them in whole. Most of my other pots except the really huge ones aren’t wide enough to do that. Save a pint or so of the water after the noodles are cooked, in order to save time and power when making the broth. 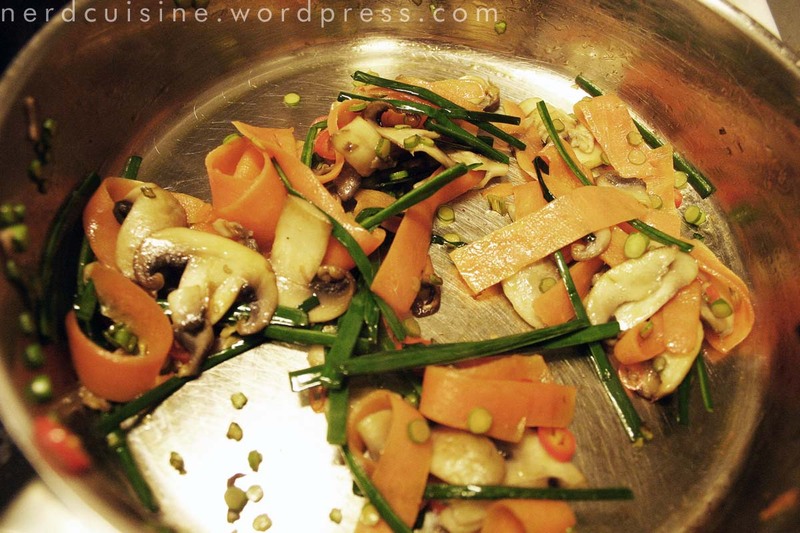 Meanwhile, the vegetables are jumbled together in another sauté pan. I only used a bit of the green part of the leek and sliced the carrot with the help of a vegetable peeler. 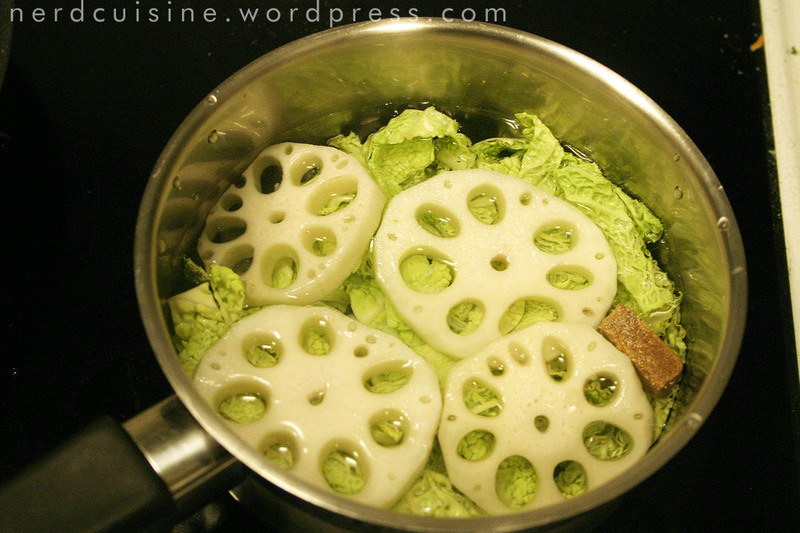 Since the lotus root slices were still frozen I simply microwaved them along with a spoonful of water for some time instead and then chopped them up a bit. 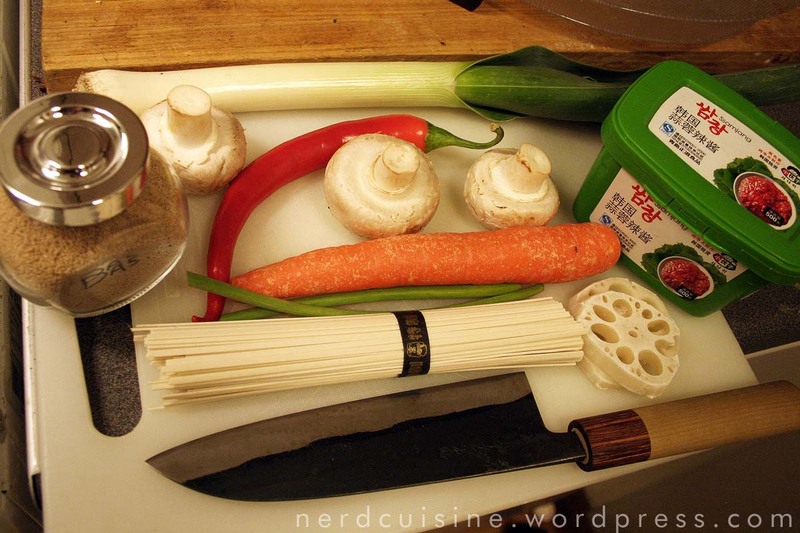 To assemble dish, simply scoop noodles into bowl with vegetables on top and then pour dashi broth over the whole thing. I topped with a dollop of ssamjang and black and white sesame seeds for additional tastiness. Surely this isn’t what they meant by ‘fusion cooking’? I went to a new Asian food store the other day. It’s been there for years, but in the past they’ve mostly seemed to sell silly kitschy stuff. This time I looked closer and found that they had a wide selection of interesting foods, such as very small frozen crabs, fresh pak choi and hundreds of different instant noodles. I managed to tear away with only a bag of instant rice noodles, some frozen lotus root and a small quantity of enoki mushrooms. To get a break from the bacon I decided to combine those with another commonly reoccurring proteins – sausages. 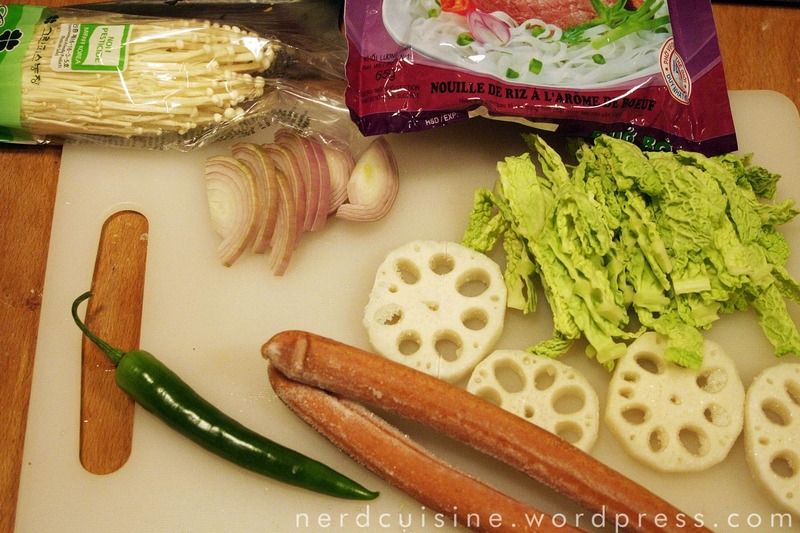 Many, but not all of the ingredients; Enoki, green chili, onion, rice noodles, savoy cabbage, frozen lotus root and frozen sausages. 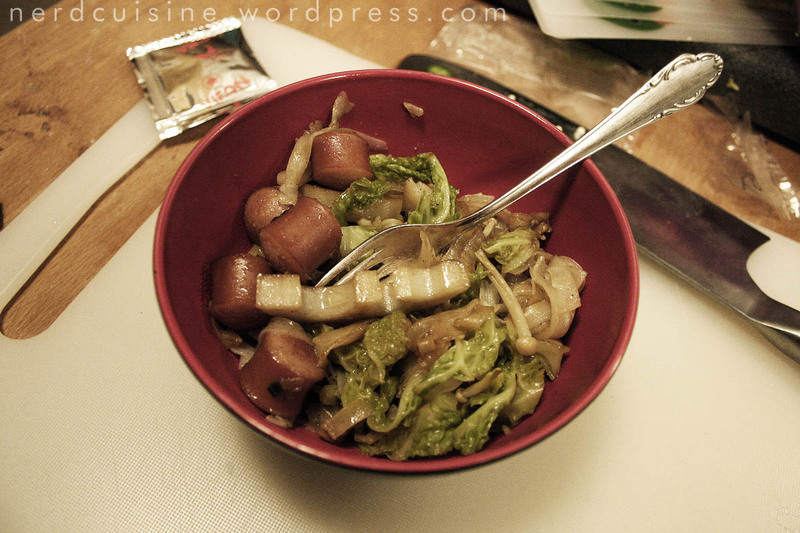 While planning the post I had someone comment that it ‘sounds like something someone would cook if they were staying at a Vegan’s house and only brought sausages ‘, which is probably both right and wrong. First, soften cabbage and lotus for a little while. If only fried and not parboiled, savoy cabbage takes some effort to digest in my opinion. Half a cube of veggie stock too. Fish cabbage and root out and drop the noodles in. This particular brand had no less than four bags of seasoning included, one of which was dried vegetables – a nice addition. 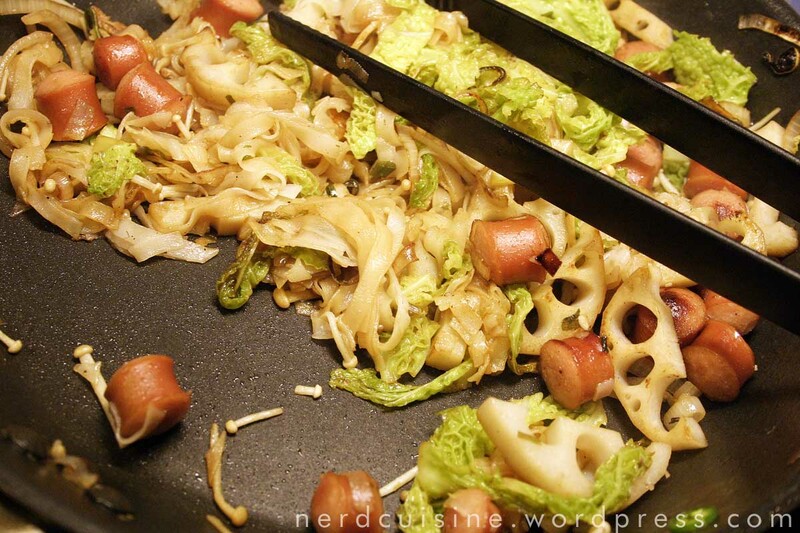 I heated a pan and dropped the onions and chili in first, then lotus root, cabbage and sausages. 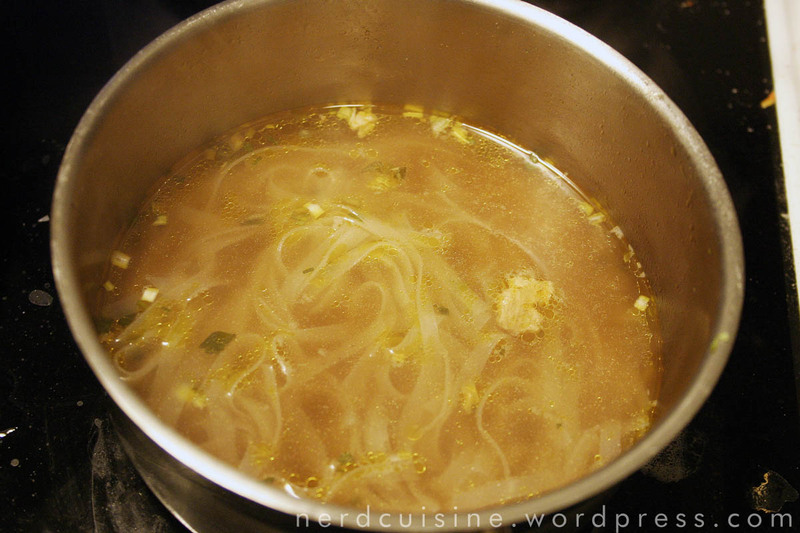 After a while the noodles were added (as usual, save the broth!) and enoki for last. I seriously doubt this is the best way to use enoki mushrooms, but at least now I’ve tried and they still look cool. Apart from chili and broth, the only seasoning I added was a splash of Japanese soy and a hint of white pepper/allspice/ginger mix. A small helping just to taste it – the rest goes in the lunch box.